If you need help in climbing the stairs then a Total Mobility Stairlift may well be the answer. Firstly it will help you regain your independence, secondly it will help you retain the full use of your home and finally it will help you remain in your home without all the expense and upheaval of moving house. All Total mobility Stairlifts are available with a hinged rail option designed to eliminate any obstruction or trip hazard at the foot of the stairs. Our aim is to provide you with the very best Stairlift at an affordable price. Our versatile stairlift solutions are suitable for almost every type of staircase. Our British built stairlifts fix to the stairs not to the wall so there is no messy or disruptive structual work or drilling into masonary and plaster. Our model 130 straight stairlift is the ideal solution for a straight staircase. 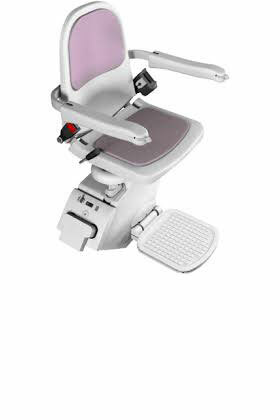 We can offer NEXT DAY INSTALLATION and it comes complete with ineretia seat belt fitted. It has a user weight of up to 127 kg (159kg heavy duty version) and includes a full 12 month warranty. We even have stairlifts available for narrow staircases and outside stairs. We can help you with stair lifts for narrow stairs. Our model 180 curved stairlift uses the innovative and unique fast track system and is available with next day installation. It has a maximum user weight of 120kg. It comes with a full 12 month warranty. We have a nationwide team of installers and service engineers on hand to ensure that you have the very best back up service and support going forward and we really believe that we offer the best value for money anywhere. For more information, a full colour brochure or a free no obligation quote about our super stairlifts prices, then please give us a call. All stairlifts carry the Arthritis Foundation’s “Ease Of Use” commendation. We cover the UK, most recently we helped people with stairlifts in Manchester, stairlifts in Birmingham. stairlifts in Swansea, stairlifts in Somerset & stairlifts in Bristol.